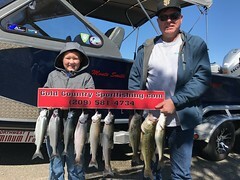 New Client Brian and his family were onboard with me for the day at Don Pedro on June the 18th. When he booked the trip he said there would be 6 guys and if I could accommodate them and I said sure no problem. With a 24 foot Willie boat there was plenty of room. After leaving the dock I gave some instructions, and then it was on! 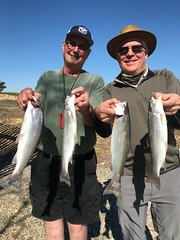 After setting four rods, the back port side rod doubled over and Brian went first, after a great fight and some good runs I was able to net the three plus pound rainbow. What a great way to start the day. The trip was all about Brian’s son Cullen as he just graduated from the United States Marines boot camp. The day was filled with a lot of ribbing , Joking and laughter and especially about someone forgetting their sandwich! The day was filled with so many fish on all the time, I was very busy keeping the rods in the water. A great day was had by all. THANKS AGAIN EVERYONE!!!!!!!!!!!!!!!!!!!!!!!! 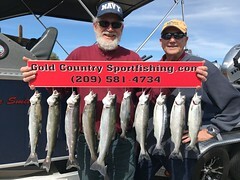 This entry was posted in Don Pedro fishing guides, Don Pedro Lake, Gold Country, Gold Country Sport Fishing, King Salmon, Kokanee, Rainbows, Trout. Bookmark the permalink.